Managing social media is without question one of the most common job opportunities for digital nomads. Social media is reported to have 2.8 billion users. Over 50 million small businesses are using Facebook Pages to reach customers. More than 4 million of those businesses are investing money into social media advertising. Moreover, social media management is a great fit for digital nomads: it can be done from anywhere and posts can even be scheduled at any time. You just need to find a business interested in outsourcing their social media posts, sign an agreement with them, and you can do your job while living a digital nomad lifestyle. You probably already have experience posting personal updates on Facebook or Twitter, thus you might think you already know all there is to know about social media management. You draft a post, make sure it looks good, and post it – what else is there to know, right? Well, not quite. In reality, managing social media is a lot more than just posting individual posts. It’s about posting high-engagement and results-oriented content, scheduling posts personalized to the network and the users you are posting to, keeping track of everything and doing analytics. How to post: how you should plan and schedule your posts, and also how you can partly automate the process and make it much more efficient. What to post: how to find content ideas, what kind of posts are likely to work best, and how to adapt your content to the biggest social media networks (Facebook, Twitter, Instagram). How to track and analyze: how you can make sure that your efforts are actually fruitful. The things covered in this guide can be helpful even if you only want to manage your own social media accounts. However, they become even more useful if you want to do it at scale or work as a freelancer, managing other people’s accounts. This guide does not talk about how you can get clients for your social media freelancing endeavor. I have already written about getting clients for your freelance business in my previous Ultimate Beginner’s Guide to Becoming a Freelancer Digital Nomad. Doing it for social media is essentially the same: you will want to use the ways described in that guide (and perhaps others) to find companies that might want to outsource their social media posts, and you offer them your services for a monthly or other fee. Moreover, this guide also does not cover administrative things like setting up your social media accounts. There is already plenty of information about such topics on the social networks themselves (e.g. see the respective pages on Facebook or Twitter), and also on other websites. The tips there are also very basic: you will probably want to have a consistent username on all the social networks (there are tools like Check Usernames which can help you in picking one), make your profiles look good, have full descriptions, include as much information as you can, etc. This guide will start with the assumption that you already have the necessary social media accounts set up and are familiar with the basic functionality of those social networks, and, if not, at least that you know where you can learn those things. Finally, this guide does not talk about marketing your social media accounts to increase your following. There are multiple strategies for this, such as buying ads, optimizing your accounts for SEO, strategically following others, organizing Facebook contests and others. Covering all of those things would be simply beyond the scope of this guide. If you are interested in some of these things, there are other online courses about growing your social media following, social media growth hacking or organizing Facebook contests that you may want to check out. With these things in mind, let’s start! One of the most interesting tips I received about social media marketing was to look at your social media efforts as if you were a TV channel. Think about it: if you were a TV channel, you would have different shows, which you would air with a specific frequency. Well, try to apply that to your social media efforts: come up with a content plan, consisting of specific content types and post that content at specific times. This section discusses the question how you can implement your content plan effectively. When people are starting out, they often make the mistake of simply posting directly on the networks themselves. Don’t even think about that! Posting individually every time is exhausting, and it will make it very hard for you to plan ahead. There might be some niches (like stock market news, for example) where you absolutely need to make up-to-date posts, but what you want to do in most cases is to set up and use a post scheduling app. I recommend Buffer. Buffer is a website app that lets you set up a content queue where posts are taken from the top of the queue every time and posted at scheduled times. It comes with a free plan, which is enough to get started. The beauty of post scheduling software is that it allows you to have all of your social media in one place and at one time. This is a godsend in terms of time management. For example, you can prepare all of your content for a specific account in the beginning of the week and concentrate on other things or projects later in the week, while content is still being actively posted. Set up automatic notifications. Most social network apps have an ability to turn on automatic notifications for posts and messages direct at you. This may not be the best tip in terms of time management, as this can distract you from your current tasks, but it works in terms of maintaining an active profile on social media – and sometimes that’s a necessary sacrifice. Use social media monitoring and engagement tools. If you are very serious about interacting on social networks, you should look into dedicated tools for tracking all interactions. Mention is a popular tool that can track all of your social media mentions, and Hootsuite is also well known for this. There are, however, many more social media monitoring tools. There are also engagement tools which provide you with a single dashboard from which you can control all of your interactions. Hootsuite is pretty good for this, and there’s also Buffer’s Reply. One tool which allows you to go absolutely nuts in your pursuit of optimisation If This Then That, which allows you to send automatic messages, e-mails, notifications or whatever else once a certain action (for example, a mention of your client’s business) occurs. Next, you should schedule posts to be published on peak hours in order to increase the exposure they get. While allegedly the rule of thumb is to time posts from 1 PM to 3 PM on week days, and different social networks also have specific times that have been observed to maximize post exposure, you should try to find out what that time is for your audience. From this, you can see that your audience is mostly engaged towards the second half of the day, and that’s when you should try to primarily schedule your content if you seek to maximise its visibility. You should reshare your content. The average effective lifespan of a post on social media can range from a few hours to a few days. This means that any given post is likely to not be seen by a large fraction of your existing audience, as well as the new audience members you acquire. Therefore it is important to reshare content, and especially your most successful content. In my experience, none of your users ever complain about you resharing content, and most of them do not even notice. However, this does not mean you should go overboard: make sure to space out the reshares and also to not repeat them too many times. Moreover, you may choose to slightly modify and change the accompanying text with each reshare. If you use Buffer, just go to Analytics -> Posts, and you will see the ‘Re-Buffer’ button next to each post you have published. Another fun tool made specifically for resharing content efficiently is Meet Edgar. With Edgar, you build up a library of content, which is divided into different categories, and set up a queue, and then Edgar moves down your queue resharing old content at optimal times. 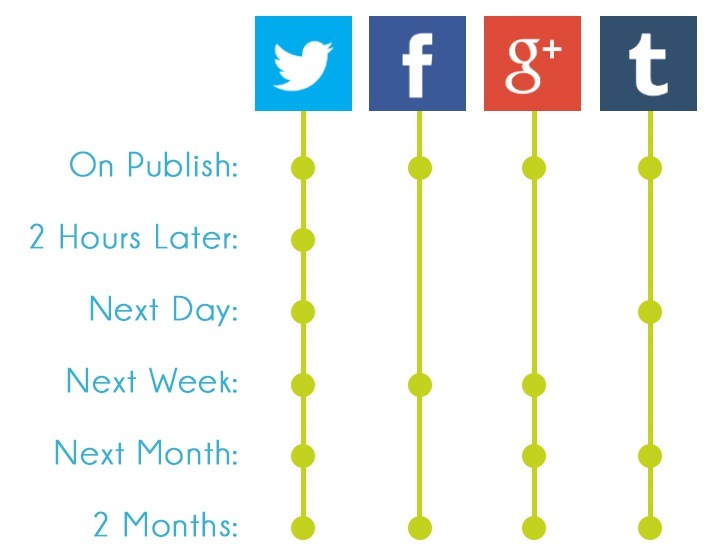 You need to develop a consistent publishing schedule for your posts. The frequency of your posting will depend on the particular social network. It goes without saying that there is no golden rule, and everything is also niche-dependent. The studies they refer to provide wide-ranging numbers, of which they simply mostly took averages. For example, 15 posts a day might be excessive, and there are also studies by Buffer asserting that clickthrough already drops after the third tweet every day. When you establish a schedule you should do your best not to break it unless something unexpected or bad happens. For example, if the company you are posting for gets into a public relations scandal, you should act promptly to suspend your social media posts. You can usually easily suspend posts on most social media management tools: for example, with Buffer, you simply go to schedule tab and click on each day of the week in order to set it to blank. While targeting is likely to be very specific each time, here is a guide to social media targeting you can refer to in order to understand more about targeting. Having considered how you should plan out your posts, we should now turn to the question – what should you post in the first place? That’s what I discuss in the next section of this guide. In the last section, we discussed how you can plan and execute your social media posts efficiently. In this section, we will discuss what you should post on social media in the first place. The exact content you will need to post for your specific audience will depend on your goals with social media (I talk about goals in the last section so check that out too! ), the business you are posting for, the demographics of their clients, previous social media communication and a lot of other factors. Here you should discuss with the business in question thoroughly, look at what your competitors are posting (you will likely want to post similar content but also have your own unique spin), and also try to see what kind of content is getting the most engagement and post more of it. Make sure to have these discussions and work on this analysis before starting to work. Given the exact content is so dependent on your concrete business, let’s rather, without going into the details of what exactly you can post, discuss which content types you should primarily focus your social media efforts on. Some research shows that visual content is more than 40 times more likely to be shared. As a result, you should consider either posting primarily visual content or at least have your content include visual elements. Make infographics – infographics are a fun and engaging way to represent complicated ideas. Moreover, there are websites like Canva where you can create infographics for free and with little design skill required. Include images and photos – try to take pictures yourself and make them look good. Alternatively, you can find all kinds of stock photos (for example, check Wikimedia Commons or Pexels for images which normally have permissive licenses). Post screencasts and video. Research shows that video is one of the most engaging and yet underused types of content. If your field involves computers, you can easily generate video by capturing your screen with specialized software. It is also getting easier to produce video by using webcams, and you should investigate whether that is an option in your business. You need to provide a constant stream of content on your social media channels. Yet creating your own content is time-consuming and expensive, thus it might be hard for you to keep up. How do you fill in the holes in your content schedule? For three out of four marketers, the answer seems to be content curation! Content curation not only provides content for your audience, but it also builds up good karma with other businesses (because you are often sharing their content) and it even lets you learn some exciting things yourself! However, content curation is big a responsibility because you can quickly lose your audience’s attention if you share bad content. You will need to select the most interesting bits and only share them. Set up a Google alert for relevant keywords in your niche; that way, you will be among the first ones to find out about new things. Find best-performing content in your niche using Buzzsumo – the tool allows you to type in any keyword and get the most shared articles for that keyword; you can also sort by date, content type, etc. The disadvantage of Buzzsumo is its expensive price. Content discovery tools like Klout help you find popular stories that your audience hasn’t yet seen. Tools like Storify help you link up content from different sources to tell stories with social media. Even though the exact content you will share will depend on the business you are managing social media for, you should still try to look out for emerging trends and interesting new developments. Follow other social media channels. Apart from just following active people on your own social media networks, you may want to subscribe to a daily digest by registering on Quora – a questions and answers website. Select your niche among your interests, and every day you will receive some of the most interesting answers to various relevant questions, which can give you lots of ideas for new content. You might also want to keep an eye out on relevant subreddits on Reddit. Check out websites with trending content analysis. One such website is Google Trends and it provides historical data on keyword searches in Google: just check out trending topic suggestions they provide, or enter some keywords from relevant niches and see what is doing well. Another popular (but quite expensive) website which I already mentioned is Buzzsumo. Buzzsumo lets you find the most shared content in any niche, thus giving you ideas not only about what content is likely to do well but also potential suggestions for your content curation efforts. Look for other interests of your audience. One underused way to do it is to use Facebook graph search. For information how this can be helpful, check out this free guide on how to use graph search. Try looking for interests, pages or posts liked by people who like your or related pages, and you should discover lots of interesting details! If you are posting for another company, they might already have a content policy in place – make sure you follow it. In case they don’t, or in case you’re posting for yourself – think about creating a social media policy which would outline how anyone posting for that particular account should conduct themselves. At first, this might seem like a useless bureaucratic step. However, as your social media posting grows, it is important to keep the consistency of content and style, as well as to preserve brand reputation. Recognizing this, lots of companies have social media policies. If you decide to draft one, have a look at this free guide. Also look at examples, such as a very famous guide for writing for Mailchimp. The one social media policy you ultimately draft and implement will depend on your company, but it will likely include tips like speaking in a human voice, avoiding arguing with customers (as everything happening on social media is public), a maintaining genuinely helpful attitude and willingness to admit mistakes if they occur. Social media networks are different, and your message should be adjusted to each. Let’s go into some sweeping generalizations and discuss the main differences between the three biggest social networks and the kind of content that is likely to work in each. The best way to look at Facebook is as an ongoing casual chat among friends spread out over a few days. Facebook is a semi-private network (a big part of all the content is public, and much if it is inaccessible to non-users), which gives its users some sense of a private exclusive conversation occurring. The largest demographic on Facebook (and thus most actively targeted by marketers) is 25 to 34 years olds. The lifespan of content is a few days thanks to the newsfeed feature, which shows users relevant content even if they are not visiting a particular page. Content is relatively short: while there are no length limitations, short posts with as few a 40 characters get maximum engagement. Content that gets engaged with on Facebook tends to be entertaining or surprising. Due to the semi-exclusive nature of Facebook posts, provocative or novel content also works well. If Facebook is an ongoing chat between friends, Twitter is more of a real-time speech or conversation. Twitter is public (save for a small exception – protected accounts), and focused on one-way communication. Twitter is mostly used by people in the 18-29 age bracket, and it is geared towards the more educated. Due to the real-time nature of Twitter, post timing is extremely important. A large part of all engagements with a tweet take place within the first hour. Content that gets engaged with on Twitter tends to be newsworthy (86% of surveyed Twitter users said they use the network for news, funny (especially in a silly or ironic way – for example, GIFs are a very popular content type on Twitter), memorable. Twitter is used massively for customer service. Be ready for messages asking for customer service and make sure help reaches the users messaging you. Twitter can also be used for engagement with interested people: you can use Twitter search to find tweets mentioning relevant services and interact with them almost real-time. Instagram is an indie mobile photo gallery. Instagram has 95% of its users under 35, and predominantly female. Instagram has super high mobile penetration – some estimates say as high as 98% of all hits are on mobile. Instagram is extremely high-engagement: per-follower engagement for brands is reported to be 58 times higher than on Facebook and 120 times higher than on Twitter. Content that is artistic, indie or passionate is also likely to do well on Instagram. Instagram also likes personal content: posts tagged with another user or location have 56% to 79% higher engagement rates. This concludes our discussion of what to post on social media. Even though we’ve only discussed three social networks in more detail, I hope this gives you an idea about how various social networks might be different from each other, and what you should look for when posting on them. In the last section, we’ll talk about analyzing social media data. In the previous section of this guide, we discussed the kinds of content you should post on social media and how various social networks are different. In this final section, I will briefly discuss how you can effectively analyze your social media management efforts. When performing any analysis, you ought to have your social media goal in mind. There are different kinds of goals, and the ones you choose depend on the business you are managing social media for. Common social media goals are driving traffic to your website, increasing sales, and accumulating fans or generating brand awareness. Goals are important because the metrics you will pay attention to will ultimately depend on those goals. Here is my best tip: try to tie your goals to concrete outcomes in terms of what you want your users to do, and measure how you achieve those outcomes. For example, you could measure how much sales coming from Facebook increased over a given period, or how many new mentions your social media accounts have attracted compared to a period in the past. However, try to be very specific about the metrics you care about and be clear as to why those are important metrics. You should, of course, also measure traditional social media metrics of engagement: likes, shares, and comments. Find out which of your posts perform the best in terms of these traditional metrics, and also compare your current and past performance, as well as the performance of your competitors. Please note, however, that those traditional metrics do not always lead to you achieving your goals (for example, people might like a particular social media post because they found it funny, but that post might be very poor at leading people to buying the particular product it is linking to). When it comes to where you should do your social media analysis, the first place to go to is the tools provided by the social networks themselves. Facebook has Facebook Audience Insights. There are also Instagram Insights, Twitter Analytics, Pinterest Analytics and many other tools. For all metrics related to engagement with the website, you might want to use Google Analytics. There are also many additional social media analytics tools, however, you should be able to dispense with most of them by simply focusing on your core metrics. If you are interested in learning how to do analytics in more detail, there is an online course on the topic. If you want to go really advanced into the topic, you may also want to learn how to use the programming language R to analyze social media metrics. After you are done analyzing, you should adjust your social media efforts to the results of your analysis and start again. If you do this enough, you will start getting a sense for what kind of content works, and that will make you a lot more efficient at social media management, giving you more time to explore the places you go to as a digital nomad. This concludes the guide. If you want to learn even more about social media or even get a certificate as a social media manager, you could check out this online course. Otherwise, I hope you have picked up enough tips to kickstart jour journey towards effectively and successfully managing social media pages and living your life as a digital nomad!